On the second day of my Dubai trip, I enjoyed breakfast at PAUL and had a great time exploring the Desert of Dubai. Hey there, fellow wanderers! Welcome to my Dubai Diaries series where I’m sharing the travel logs of my 5-day trip to Dubai, UAE. In this second part of my Dubai Diaries travel logs, I am penning down the second day of my Dubai trip – the day when I explored the streets of Dubai further, enjoyed an awesome breakfast and got busy exploring the desert of Dubai. After I came back from enjoying some delicious shawarma wrap and fried chicken in Deira area near my hotel, I went straight to sleep – waking up almost 10 hours later on the next day. I had many plans playing around in my mind but I wasn’t really sure what exactly would I be doing. I simply made no plans before leaving for Dubai and so here I was – thinking where to go, what to do. My Dubai Desert Safari event was booked in advance before I arrived in Dubai. My pickup was scheduled at around 3 PM. So whatever I decided to do, I had to be back before that time. Keeping this in my mind, I decided not to go somewhere distant. I had more than six hours before my pickup and I could definitely go to and come back from almost any location in a taxi, bus or metro. What stopping me from doing this was my budget – which didn’t allow me to spend money on things like a taxi, unless I really need to. I prefer walking to any location I could cover on foot and so I decided to take a walk – still unsure exactly where. I took a shower and got ready. After taking a glance at the map on my phone, I started walking. After I started walking in a direction and reached the end of Al-Rigga road, I opened the map again to see if there was something interesting nearby. Nothing caught my attention yet, so I kept walking. 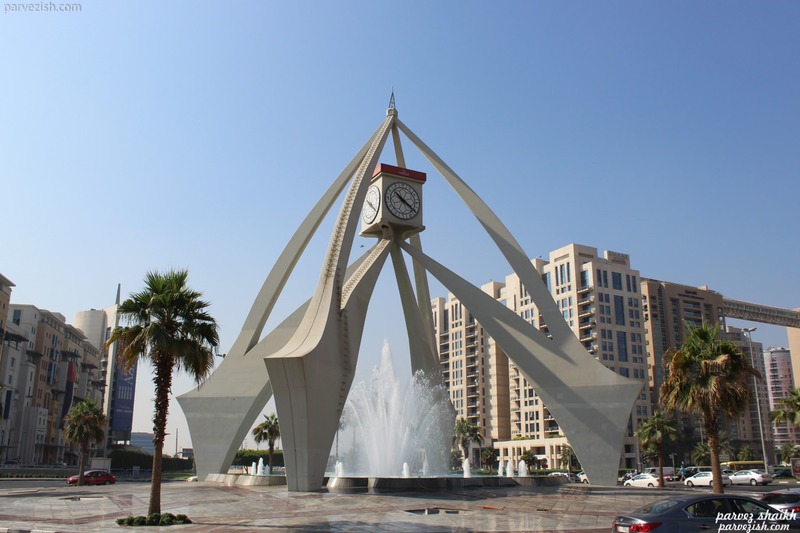 I soon saw Deira Clock Tower in middle of the road and continued walking in its direction. After snapping some pictures, I opened the map again and saw City Centre Deira nearby. I walked straight into City Centre Deira and found it to be a shopping mall full of shops, cafes, and restaurants. I wasn’t planning to shop anything just yet. But as I was already here, I decided to take a look around inside. Upon reaching the first floor, the smell of baking caught my attention. “Now, now. Where’s that smell coming from?” Asked my appetite, and my crazy little nose turned into the direction of PAUL bakery and cafe. I was unable to cope with the smell of baking. Just as I was enjoying this aroma, a voice caught my attention. It was a lady attendant at PAUL who greeted me saying “Good morning, sir. Welcome to PAUL.” And within a moment, I was sitting at a table in exact center of the cafe. It wasn’t long before I was attended by Allan, a well-trained, enthusiastic young man. I introduced myself and he was happy to see someone taking interest in the place he was working at. Allan happily answered all my questions before I finally ordered my breakfast. I spent about 2 hours at PAUL enjoying my breakfast and having conversations with Allan and Urmila (the supervisor). As I had to reach back at my hotel before 3 PM and had a long walk to take, I soon left the place – happy and heavy! So how was my experience at PAUL? Read my review of PAUL, City Centre Deira to find out. On my way back at the hotel, I spotted this beautiful mosque called Khalefa Altajer Masjid (mosque). Picture snapped on my iPhone 4S. After a delicious French breakfast and some sightseeing on my way back, I finally reached at my hotel just before 3 PM. After getting freshened up, I was ready for Dubai Desert Safari. I went downstairs to wait for my pickup. A guy in traditional Arabic attire came looking for me soon. Mohammed Shafi – my driver for the day, was a polite and well-behaved man. We rode across nearby roads to pick up other attendants and within 20 minutes, we were on out way to the Desert of Dubai! In the car besides me and Shafi were two girls from France, a girl from Atlanta, Georgia, USA and a couple with a cute little girl from Chandigarh, India. It was an awkward time before we reached our first stop in the desert – when we finally started talking to each other. The girl from Atlanta, USA who originated from Portugal, Brazil, and I had a long conversation along the way. We talked about mine and her travel plans, new year celebration etc. We also discussed the song Danza Kuduro – which was being played in the desert camp. The only thing we didn’t ask each other were our names! I asked for her Instagram handle, though. I gave her the link to this blog and she bookmarked it. I’m not sure what went wrong, but when I came back to the hotel, I couldn’t find her profile on Instagram. Weird but true. Now I don’t know her name and can’t find her on Instagram – leaving this blog as the only point of possible contact. Note to the girl: If you ever visit this blog, do leave a message! We promised to meet when I’m in Atlanta, remember? I also had a great time with other participants. The little girl bonded with me very well. Her parents and I had long discussions about different places and topics. I don’t remember asking their names either! 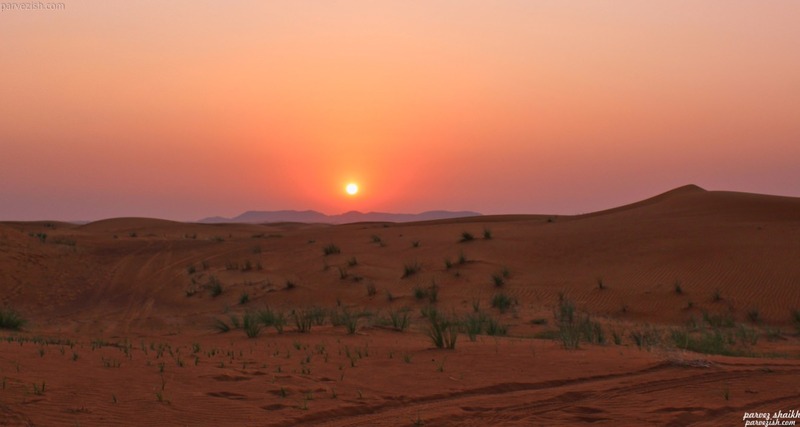 Dubai Desert Safari was an activity filled with adventure. After a long, bumpy ride in the desert, we stopped in the middle of the desert at sunset. It was a beautiful scenery. We took a lot of photographs here before leaving for our final destination – a Bedouin-style camp. Different performers presented their performance at the camp. After the final performance, we had dinner buffet waiting for us. We had our dinner, talking about different things. Also present were some cute little cats, eagerly waiting for someone to feed them. We spent about two hours at the camp before leaving. Shafi dropped me at my hotel, ending my Dubai Desert Safari trip. Exploring the Desert of Dubai was complete fun. 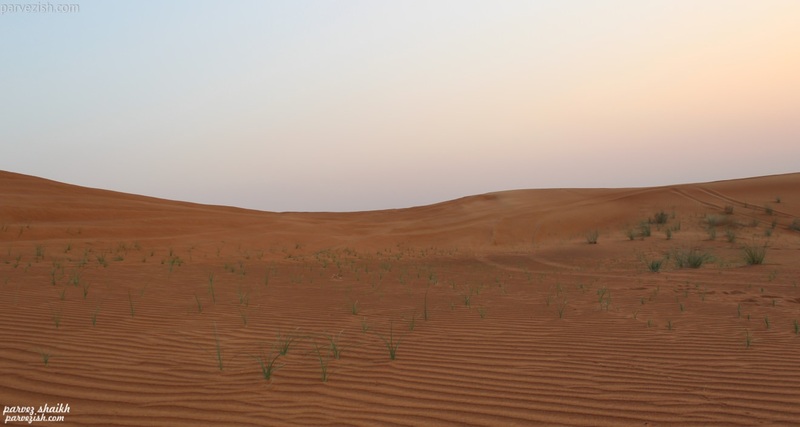 Read my full review of Dubai Desert Safari to learn more about the activity. On the second day of my Dubai trip, I took a long walk on streets of Dubai to City Centre Deira. 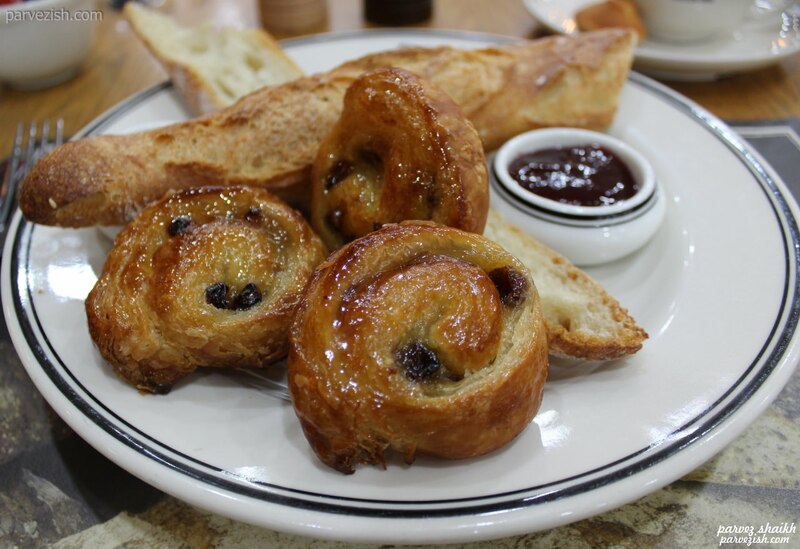 I enjoyed delicious French breakfast at PAUL. I left for Dubai Desert Safari in the noon and made some good friends with no names. Exploring the desert of Dubai was a great fun and my day ended with my driver Shafi dropping me at my hotel. That’s it, folks! This was the travel log of my second day of Dubai trip. More entries are coming soon. Stay tuned. I would love your comments, feedback and suggestions. Feel free to share your own travel experiences, too!